When I first started exploring fountain pens the Pilot Vanishing Point came up again and again. There were tonnes of reviews all singing the praises of this fountain pen. However there was always one thing that bugged me about this fountain pen and that was the position of the clip. To me it looked like it would be in the way and I couldn't understand how I would be able to write with it in that position. So for a long time this put me off. But the Vanishing Point kept haunting me, there were more reviews, and mentions on the Pen Addict podcast so I caved and snapped one up from Pen Chalet. It took me ages to decide on a colour. I flitted between the orange, blue, green and grey but I finally decided on the Matte Black (turns out this is not the best colour for blog post photos). It was slightly different to the initial options but I thought I would go for something that looks subtle. The Vanishing Point is obviously a bit different in terms of set up as the nib is retractable. The below picture shows the set up (excuse the inky nib). The set up is very different to any other fountain pen I own. When I first inked the pen up I was shocked at the size of the nib. It's really small and very very slim. The ink is filled through a piston filler and is held in the silver section of the pen. I have been using my Vanishing Point every day for a few weeks and so far my ink has lasted well. In order to put the pen back together again you have to ensure that the nib and ink reservoir aligns correctly to the pen barrel. This ensures that the nib is the correct way round in the pen and I guess protects it from any unwanted accidents. There is a notch in the top half of the pen barrel which is aligned with the pen clip. If you do not align the pen correctly then the barrel will not screw back together again. You can this in the image below. The Vanishing Point design is very good and looks a lot better in person. Everything is simple and sleek. The matte black finish is great and gives the Vanishing Point a quality feel without being brash. The pen has a great weight feeling solid and is good for writing with for long periods of time. I was very apprehensive about the clip but surprisingly this doesn't get in the way. You kind of just work round it. I haven't adjusted my grip and I thought I may have to. I think if anything it stops you holding the pen in an odd way and is almost like a correctional tool. This is the unusual element of the Vanishing Point and I guess where the name comes from. The nib literally sits within the pen with a small 'door' that protects it from any nasty stuff getting inside. This confused me at first as I thought in the retractable format the nib would get damaged. But this isn't the case, the door provides the protection the nib needs. 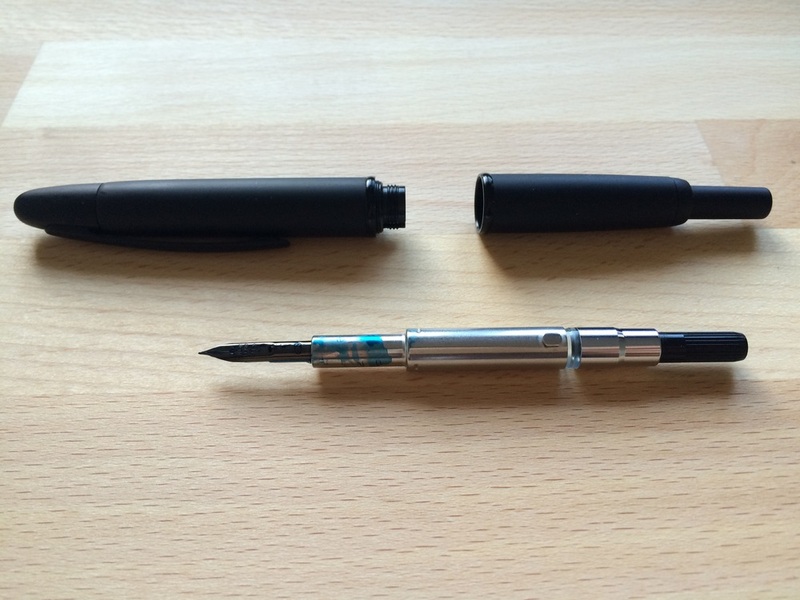 The nock of the fountain pen pushes the nib out of the pen and opens the door. I have included a short video clip of this in action. It's not the best video but gives you an idea of how this works. I opted for an EF nib with the Vanishing Point which was probably a little bit risky, but I am really pleased with it. I love a fine nib fountain pen but this one goes above and beyond. This is my first EF nib Japanese pen and its really, really good. The EF nib lays down a seriously fine line. I have never used a nib this fine but it allows the fountain pen to be used in different ways such as for sketching. The nib can be a bit scratchy on the page but that's to be expected with something so sharp and fine. It looks great and holds up well on different paper types. I have been using mine with the Baron Fig Confident notebook and the Calepino pocket notebooks lately and both have worked very well with the EF nib. If you're in the market for a high quality fountain pen that is different to anything else you would own then you should definitely be considering the Pilot Vanishing Point. There are lot of options available to all sorts of fountain pen users with different nib sizes and colour options. 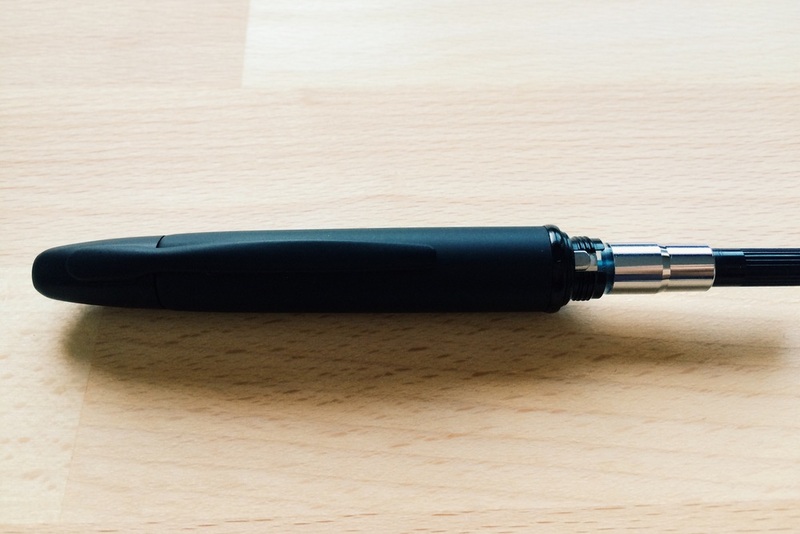 With the piston filled ink reservoir you can tailor this pen to exactly how you want to see it.